Pinpointing the location of bipolar disorder in your brain is almost as difficult as finding affordable health insurance. Brain imaging studies have found few consistent changes when looking at large brain structures. They’ve had much more success looking at changes at the cellular level and, in particular, at functional changes in cells and groups of cells in particular brain areas. Here is some basic brain anatomy and physiology that helps explain the research. Looking at a whole human brain from the outside, as shown, you see the cerebral hemispheres (the large sections, not labeled in the figure, that comprise most of the brain), the cerebellum (the small ball toward the back of the hemispheres), and the brain stem (a long, thin structure leaving the brain and connecting it to the spinal cord). The cerebral hemispheres are divided into four sections that serve broadly different functions — the frontal lobe, the parietal lobe, the temporal lobe, and the occipital lobe. The human brain from the outside looking in. When you open the brain up, pulling the two hemispheres apart into two equal parts, and look inside, you see a number of brain structures within the hemispheres. Within the outer layer, researchers have identified a number of cell areas related to different functions. Several of these areas appear frequently in studies of bipolar, including the prefrontal cortex and the anterior cingulate cortex. Below the large outer layer are a number of structures, some of which are quite important in bipolar disorder research, including the thalamus, hypothalamus, hippocampus, and amygdala. The frontal lobe is the executive of the brain, serving to coordinate and manage the many functions within the body and brain. The parietal lobe is involved in managing sensory experiences, in addition to playing a role in many other functions. The temporal lobe is involved in smell and auditory sensory input, speech and language, and memory and learning. The occipital lobe is the center for processing visual stimuli. All these areas perform many other functions, as well, and functions may overlap between areas. Cerebellum: The cerebellum appears to manage the fine-tuning of complex movements and also seems to be involved in regulating thought, language, and mood responses. 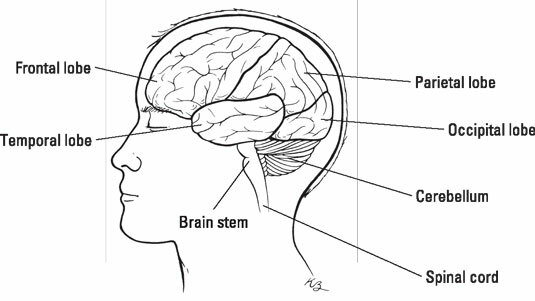 Brain stem: The brain stem manages basic survival mechanisms, such as breathing and the heartbeat, and is involved in the management of consciousness, alertness, and sleep/wake cycles. Cerebral cortex: The cerebral cortex is the outer layer of brain cells in the hemispheres. It’s considered to be the site of higher level thinking, coordinating incoming information and generating movement, actions, and thoughts. It’s broken down into a number of smaller areas associated with specific types of function. Prefrontal cortex: The prefrontal cortex is a section of the cerebral cortex that is highly developed and is involved in regulating complex thinking and behavior; it’s considered a center of judgment and planning. Hippocampus: The hippocampus is located in the cortex (subcortical) and is especially important in learning and memory. Thalamus: The thalamus is a structure that sits below the cortex (subcortical) that serves as a relay station for sensorimotor input, conveying it to areas of the cortex. It also regulates sleep, consciousness, and levels of alertness. Hypothalamus: The hypothalamus is also subcortical and regulates many survival mechanisms such as hunger/thirst and sleep/wake and energy cycles, all components of circadian rhythms — physical, mental, and behavioral patterns that occur in approximately 24-hour cycles. 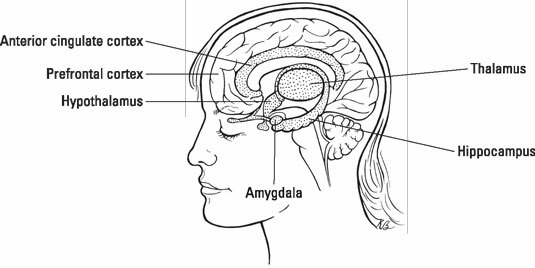 Amygdala: The amygdala, another subcortical area, is a major player in the brain’s reaction to emotions. Limbic system: The term limbic system is used to describe a number of brain areas important to emotional function. The list of areas can be different in different textbooks but the hippocampus, thalamus, hypothalamus, and amygdala are considered main components of this system. Anterior cingulate cortex: The anterior cingulate cortex is a part of the cortex that has strong associations between the prefrontal cortex and the limbic system and is thought to play an important role in regulation of strong emotions. The brain has several layers. The outer layer of the brain is referred to as the cortex, often referred to as the gray matter. The layer beneath the cortex is a network of fibers that connect different areas of the brain that’s often referred to as the white matter. The fibers are protected and insulated by a layer called the myelin sheath. Within the brain is a system of cavities, including spaces called the ventricles, that make, circulate, and then re-absorb cerebrospinal fluid. This fluid serves as a mechanical shock absorber to the brain but also brings nutrients from and filters waste back into the blood stream. Another important component of brain anatomy is comprised of cells that make up all these structures. Brain cells include neurons and glia. Neurons form the telecommunications system in the brain and body, dictating body functions by generating, sending, and reacting to electrochemical signals. Glial cells, once thought to be just a support network for neurons, play a major role in brain function and in the brain’s communications and reaction systems. The gray matter of the cortex includes the cell bodies (central section) and dendrites (one of the connecting ends) of neurons, as well as glial cells. The white matter is made up of the axons (another type of connecting end) of neurons. Neurons communicate with one another in many different ways, but communication occurs primarily across the synapse — the space between neurons or between neurons and other cells such as a gland or muscle cell. 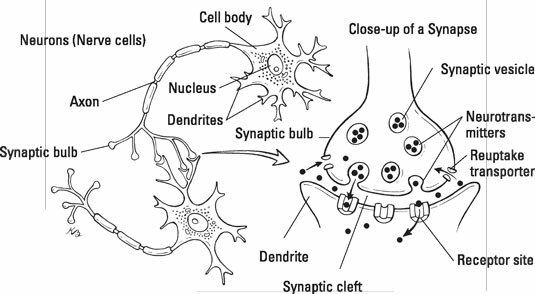 The most common type of communication occurs when one end of the neuron (often the axon but not always) releases a chemical messenger into the synapse (as shown). The next cell (often the dendrite of another neuron) receives the chemical messenger. Receptors on the outside of the second cell latch onto the chemical messenger. Cells have many different types of receptors for all of the chemical messengers; the type of receptor influences how the message is received and processed and how the instructions are transmitted to the second cell. After a chemical messenger occupies the receptor, it can generate many different responses in the receiving cell, depending on the chemical messenger and the receptor type. After the messenger has done its job, it’s released from the receptor and then taken back into the first cell, a process called reuptake. In the brain, the chemical messengers are often referred to as neurotransmitters. Nervous system cells communicate in ways beyond the synapse; for example, chemicals called neuropeptides communicate between cells but not across synapses. Of great importance in the current research on bipolar disorder is the communication between glial cells and neurons. Disruptions in these communication systems may be at least as important as problems in neuron-to-neuron transmissions. Intracellular (within-cell) communication may also play a role.